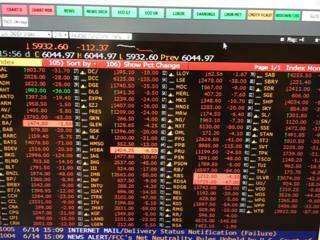 Stock markets across Europe fell on Tuesday as investors weighed up the consequences of next week's EU referendum vote. The FTSE 100 in London closed down 2%, or 121 points, at 5,923 - the first time the index has been below the 6,000 mark since February. The Cac in Paris sank 2.3%, while Frankfurt shed 1.4%. Jitters sent yields on 10-year bonds issued by the German government negative for the first time. Recent opinion polls have suggested that there may be growing support for a Brexit vote in the 23 June referendum. "Markets are on the verge of a full-blown panic sell-off due to rising probability of Brexit," said Rabobank analysts. PVM Oil Associates analyst Tamas Varga said: "Safe havens are back in fashion. The thought process is that if the UK leaves the EU, then the EU might slip back into recession." Markets were already jittery over the health of the global economy and worries over when the US may start raising interest rates. A new survey from Bank of America Merrill Lynch showed fund managers were holding more cash than at any time since 2001 and have reduced the number of shares they own to four-year lows. "Globally, sentiment remains weak," the survey said. Yields on 10-year UK government bonds fell by a significant amount - 0.06 percentage points - to a record low of 1.146%, while 20-year and 30-year "gilts" also dropped to record lows. The decline in yields for government bonds reflects strong demand from investors for a safe place to park their money. In the case of Germany, the yield fell as low as minus 0.032% - meaning investors were prepared to pay, rather than be paid, to own "Bunds". Luke Hickmore, co-manager of Aberdeen Asset Management's Strategic Bond Fund, said that Bund yields could fall as low as minus 0.1%: "This is just investors getting, very, very, very nervous about the way this [Brexit] vote is going to go." Ulrich Kater, economist at DeKaBank, said the uncertainty about a possible Brexit was driving investors to the safe haven of German bonds. "The drop in yields below the zero mark once again shows the immense challenges currently facing global financial markets," he added. LBBW analyst Werner Bader added: "Fears that Britain will quit the EU has killed off any willingness to take risks." The yield on Japan's 10-year government bond, which has been in negative territory for some time, fell to a new low of minus 0.175%. Something has tipped the yield on German government 10-year debt into negative territory. But it is still an extraordinary fact that it was anywhere near that to start with. It reflects the persistent failure of the eurozone to generate a really convincing recovery from the financial crisis. That in turn led to the European Central Bank taking extraordinary steps that have kept the downward pressure on bond yields. It's partly about the European Central Bank's ultra-low interest rate policy, which tends to drive down the returns on other assets that pay interest. But perhaps the big contributor is the ECB's quantitative easing policy, which involves buying bonds, including those issued by the German government. That tends to push the prices higher, and with a bond, the yield goes down when the price rises. The yield on Germany's bonds was always relatively low as it is regarded as a borrower that is certain to repay. As a result it's little surprise that it was the first in the eurozone whose 10-year bonds should go into the weird world of negative returns. Sterling fell 1.1% against the dollar to $1.4115 as opinion polls showed mounting support for Brexit ahead of next week's EU referendum. Investors are betting sterling will fall, regardless of the outcome of the 23 June vote, with millions placed in the derivatives market, where traders can speculate in the future price of currencies. James Ruddiman, director at currency broker Audere Solutions, said: "Expect some wild swings in the coming days, with $1.40 the next level to watch. I would expect greater degree of panic if the 'leave' margin widens in the coming days." Since the start of the year sterling is slightly down against the US dollar from its high of $1.47. Luke Ellis, president of Man Group, the world's largest listed hedge fund, told BBC Radio 4's Today programme that most of the activity was by companies looking to protect themselves against a fall in the pound. Few traders were prepared to call the outcome of the referendum, he added.